I look forward to Marvels of the Ages Calling Forth Lost Spirits of Information at Truck. Last summer, I saw the bodies of the main characters, the player pianos, eviscerated on Robyn Moody’s back lawn. Since then, I’ve studied the on-line clip of the first performance on the pedestrian courtyard outside the Sunalta Transit Station in September 2013. That was shortly before the tercentenary of the birthday of French philosopher and writer, Denis Diderot, whose seminal encyclopedia informs the nerve centre of the project. Intrigued, I sought out the collaborators, Robyn Moody and Denton Fredrickson, to talk about the ideas and the making of the work as they finish preparations for the next stage. 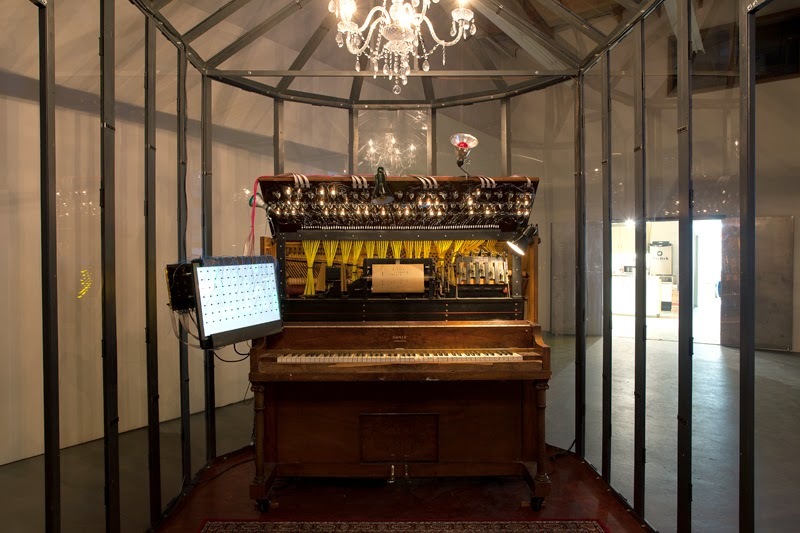 The germ of the idea for this piece began as Robyn bought a musical scroll for a player piano in Oxford, and realized he had no way of knowing what it contains. 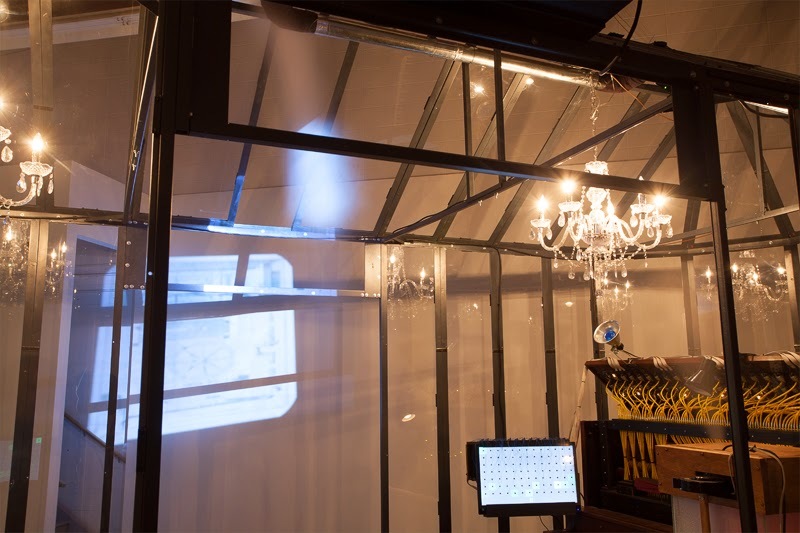 The installation promises to be smart, magical and wondrously wrought. I will enjoy decoding, but expect that even close observation won’t reveal all. Information will not equal knowledge. I imagine it will gnaw and ultimately haunt me. Let’s pretend I am one of the first visitors. 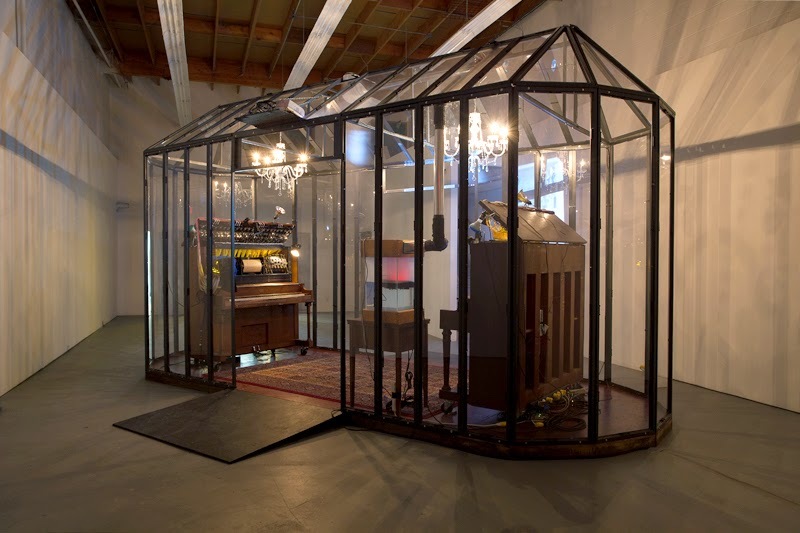 It is humid as I enter the greenhouse structure where the Oriental rug and two turn-of-the- century player pianos reinforce my sense of a Victorian parlour. 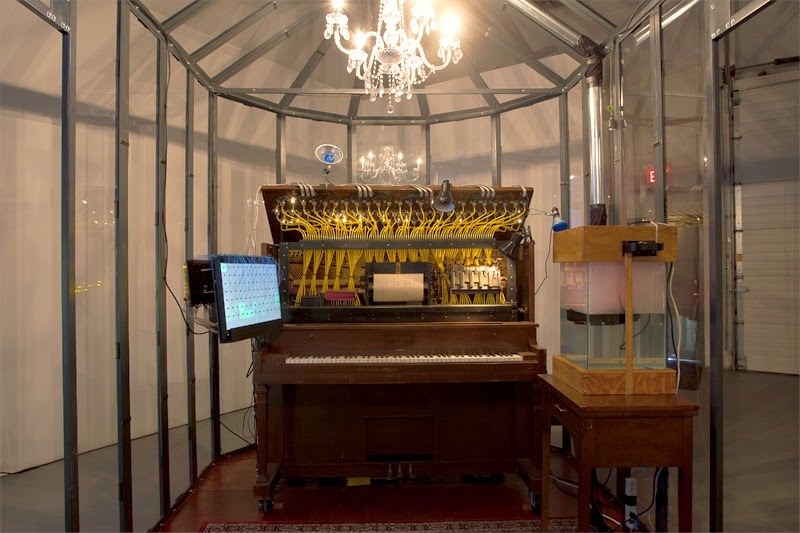 Are the pianos on a form of life support, their original bellows replaced with tubing and mechanical vacuum-forming apparatus? Each is hooked up to an overhanging grid of lights. 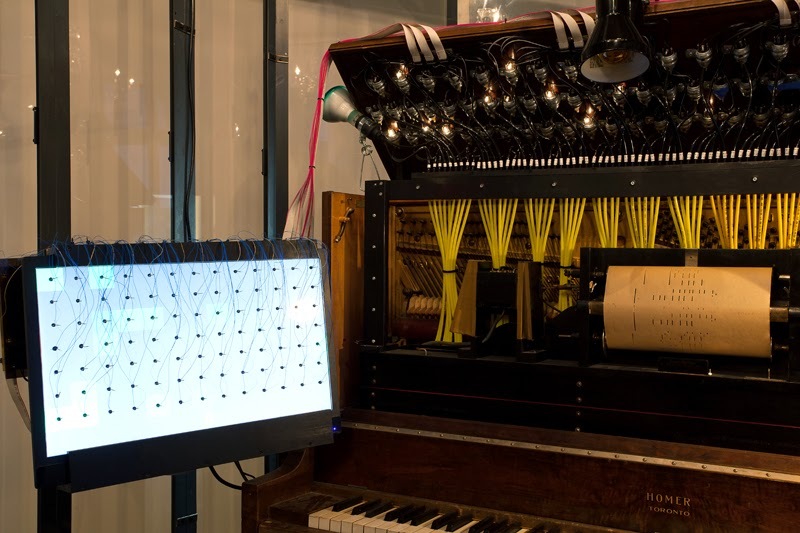 As single squares light up, a letter or number appears below, a key of the piano moves, a note sounds. Both pianos play, tentatively at first. With effort, they speed up, seemingly anxious to communicate. I believe I can discern a chord or a phrase, a bit of coherent musical language and a sequence of letters that forms a word. Beneath their notes, I hear muffled wheezing sounds that carry the rhythm of human speech. Perhaps these elders have already crossed to the other side, and I am in the midst of a séance, an attempt to communicate with and through a bygone information delivery system? Mist descends from the ceiling and wraithlike images from all branches of human study appear and disappear – illustrations, diagrams, works of art. Bolstered by the recognition of images, I try to make sense of the spectral sights and sounds, hoping for a clearer understanding, but they exhaust themselves and return to silence. I look for connections. 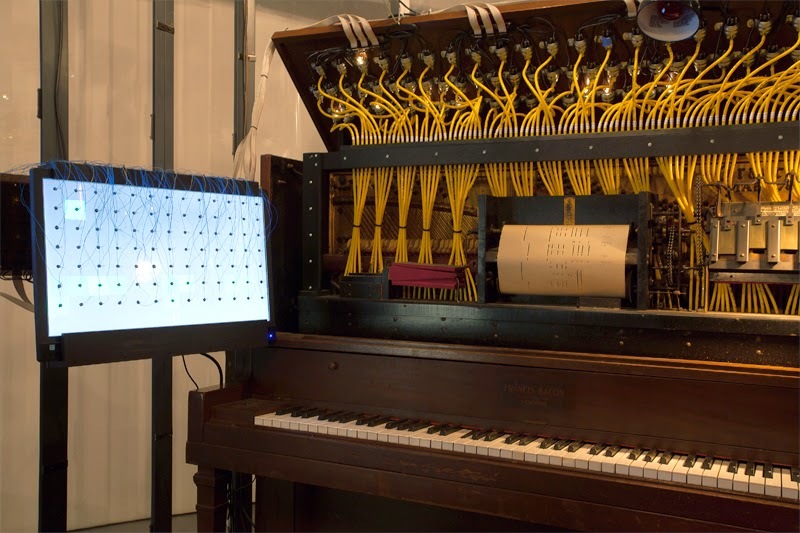 Is there a clue in the numbers: 88 keys on the piano, 101 keys on a keyboard? What generates the sequence of letters and numbers? I learn that one piano channels Diderot’s Encyclopedia, completed in 1772, and the other Wikipedia, launched in 2001, both built on the philosophy that access to information can help to build knowledge and benefit all. From Denton Fredrickson, I learn that University of Lethbridge students selected the text. Acting as the medium behind the curtain, they followed their interests in the encyclopedia and hyperlinks in Wikipedia. They themselves operate at a turning point in the mechanics of reading, presumably still literate as “long form text” readers, and certainly fluent in hypertext. I recall a story from the head of Archives at the Glenbow Museum. When he showed letters from soldiers at the front in WWI to university students in Calgary one recognized the object as a letter, but was unable to read the cursive writing. It’s not taught in school anymore. 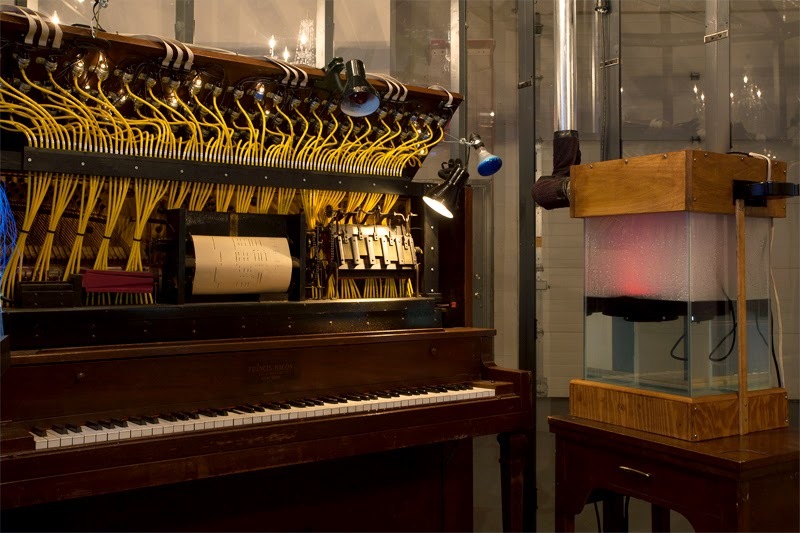 From Robyn Moody I learned that when phonographs, the new marvel of the day, replaced player pianos, many of the grand old instruments were burned for firewood. If Y2K made me aware of how dependent we are on computer technology, I believe the slow leak of information loss as technologies become obsolete is now a more insidious danger. Katherine Ylitalois an independent curator, writer, garden historian, horticulturalist and educator based in Calgary with extensive experience as a museum professional in Canada. Her most recent project, “Made in Calgary, 2000’s,” was the final chapter in the Glenbow Museum 5-part series celebrating the artists of this city. “Made in Calgary, 2000’s” took the form of two sister exhibitions held at the Glenbow Museum and the Nickle Galleries at the University of Calgary in fall, 2014. Ylitalo earned her Bachelor’s and Master of Arts Degrees from Stanford University in California in fine arts and education. She taught at Chemeketa College, St. Lawrence College, the Nova Scotia College of Art and Design and the University of Regina and worked as a ceramic artist in Ontario, Nova Scotia, Oregon and Saskatchewan before making Alberta her home in 1986. In Calgary, she worked as a curator of contemporary art at the Glenbow Museum and the Nickle Arts Museum and taught at the Alberta College of Art and Design, Mt. Royal College and the University of Calgary. She has been involved in curatorial projects at several galleries across the country including the Art Gallery of Peterborough and the Walter Phillips Gallery.